When is the book coming out Bilgerat? I am a Steam man but you have made these ships interesting. You publish and I, for one, will buy. Once again Bilgerat fascinating. Thank you. HMS Bristol was a Portland Class 50 gun, Fourth Rate ship of the line built by the Royal Dockyard at Sheerness. Up until the mid-1750's, the 50 gun 4th rate was the smallest ship of the line in the Royal Navy. After that time, they were regarded as being too small and frail to stand in the line of battle. They continued to be useful as small ships of the line in the shallower waters off northern Europe and North America, where larger ships of the line had difficulty operating safely. They were amongst the smallest ships to carry their guns on two gundecks and despite being obsolete in the line of battle, the Royal Navy continued to build and operate small numbers of these ships after the 1750's. By the end of the 18th century however, the advent of new larger frigates mounting 18 or 24 pdr guns had rendered them obsolete and although the Royal Navy continued to use them for a while, by the end of the Napoleonic Wars, they had largely disappeared from the fleet. HMS Bristol was ordered from the Sheerness Royal Dockyard on Wednesday 12th October 1768. Her construction was overseen by George White, Master Shipwright at Sheerness, her keel was laid in May of 1771 and the ship was launched with her hull complete on Wednesday 25th October 1775. The ship was fitted with her guns, masts and rigging at Sheerness and was commissioned there on Wednesday 13th December 1775. On completion, HMS Bristol was a ship of 1049 tons, she was 146ft long on her upper gundeck and was 40' 7" wide across the beam. She was armed with 22 24pdr long guns on her lower gundeck, 22 12pdr long guns on her upper gundeck, 4 6pdr long guns on her quarterdeck with two more on her forecastle. She was manned by a crew of 350 men, officers, boys and marines. Her construction up to the date of launching had cost £23,440. 11s 10d. Fitting her out cost a further £3,574. 16s 5d. The ship commissioned under Captain John Morris. 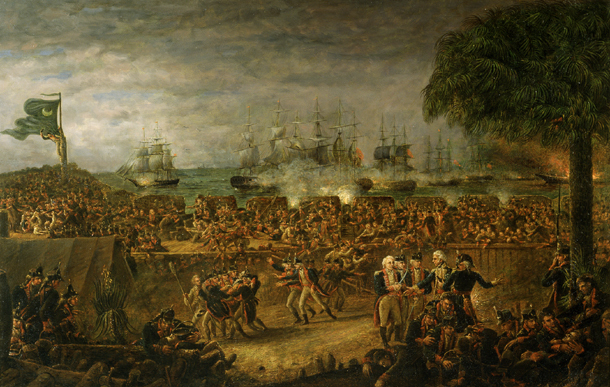 By the time the ship was ready for sea, what had started out as protests in the American colonies against what the colonists saw as unfair taxation and the illegal denial of their rights to representation in Parliament as British subjects had escalated into a full-scale, armed rebellion. 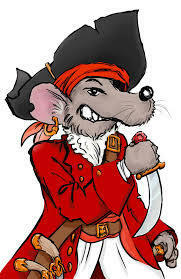 To make matters worse, the old enemy, France, was covertly supplying the rebels with arms and what would today be called 'military advisors', in addition to naval vessels and crews operating under American colours as privateers. It was against a background of escalating violence that HMS Bristol was sent to America, departing Sheerness on Monday 12th February 1776. Among the men aboard HMS Bristol when she left for the war in America was an 18-year old Midshipman, the Guernsey-born James Saumarez. He had already passed his examination for Lieutenant and was waiting for a vacancy to come up. Saumarez went on to become one of our greatest naval heroes in later life, commanding the British force in the victory at the 2nd Battle of Algeciras in 1801. On arrival in America, HMS Bristol became flagship of Commodore Sir Peter Parker. The British sought to establish a base of operations in the southern colony of South Carolina and had decided to take Charleston from the rebels. In order to achieve this, they first had to take Fort Sullivan, on Sullivan's Island, a sandy island commanding the approaches to the harbour. The rebels had been busy reinforcing the defences on Sullivan's Island. Parker's role was to transport 2,500 troops under the command of General Clinton, land them on Long Island and bombard the defences and breach them. The soldiers would wade across the channel between Long Island and Sullivan's Island and assault the fort, whose defences should by them have been breached by the naval bombardment. The British force, in addition to HMS Bristol, also comprised HMS Experiment (50), HMS Actaeon (28), HMS Active (28), HMS Solebay (28), HMS Sphinx (20) and the bomb vessel HMS Thunder. The British fleet moved to attack the fort, departing Cape Fear on 31st May 1776 and arriving off Charleston Harbour the following day. Over the course of the next week, the British ships crossed the sandbar and anchored in Five Fathom Hole, an anchorage between the sandbar across the bay and the harbour itself. By this time, the fort was only half-complete and Commodore Parker wrote to General Clinton and advised him that he would probably be able to take the fort with his own seamen and marines after the defences had been destroyed by cannon fire from the ships. From June 7th until June 28th was spent by both forces in preparation for the battle to come. At 09:00 on June 28th, the British fired a signal gun to indicate the start of the attack. Within an hour, nine British warships sailed into position and began their bombardment of the fort. Things did not go to plan for Parker's force. HMS Thunder had been anchored too far from the fort and so had to use larger charges so that her mortar shells would land on the fort. The soft ground inside the fort literally swallowed the landing mortar shells before they exploded and rendered her fire ineffective. Eventually, overloading the mortars to get the required range led to the mortars breaking out of their mounts. Things got worse for the British when HMS Spinx, HMS Actaeon and HMS Syren were sent to enfilade the forts main firing platform. All three ships ran aground on an uncharted sandbar and HMS Sphinx and HMS Syren got their rigging tangled up with each other. This was eventually sorted out, but HMS Actaeon had run too far onto the sandbar, couldn't be refloated and had to be abandoned and burned. The rebel commander, Colonel Moultrie ordered his gunners to concentrate their fire on the biggest of the British ships, HMS Bristol and HMS Experiment. The Americans hit the two 4th rate ships time and again. HMS Bristol was suffering particularly badly as the Americans were firing chain shot into her rigging, severely damaging it. The British attempted to breach the defences by broadside fire, but the Palmetto-wood faced defences just absorbed the cannon fire and rendered it ineffective. The exchange of cannon-fire continued until about 21:00, when the British ships withdrew at nightfall. It had been an expensive day for the British. HMS Bristol suffered 40 dead and 71 wounded and had been hit more than 70 times. During the action, Parker had been slightly wounded by splinters, which had ripped away the backside of his breeches. HMS Bristol's commander, Captain Morris had not been so lucky. He had been badly wounded during the Battle of Sullivans Island and died of his wounds on 2nd July. The British did not return to the fort and six days after the battle, the Declaration of Independance was signed in Philadelphia. 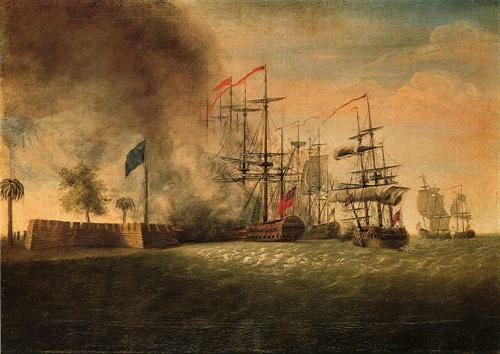 The Battle of Sullivans Island, 28th June 1776. On 11th July 1776, the young Mr Midshipman Saumarez was promoted to Acting Lieutenant. On 6th July, Captain Toby Caulfield assumed command, but he only remained in command until 6th September, when command of the ship was assumed by Captain John Raynor. On 8th July 1777, HMS Bristol was re-assigned to the Jamaica Station and the ship spent the next four years operating in the Caribbean. While she was there, on 2nd July 1778, she received a new Third Lieutenant, one Mr Horatio Nelson. He remained with HMS Bristol until December, rising to be the ships First Lieutenant before promotion to Commander and leaving to take command of the 14 gun brig-sloop HMS Badger in January 1779. In the meantime, Captain Caulfield resumed command of HMS Bristol in October 1778. On 20th March 1780, HMS Bristol was patrolling off the northern coast of Haiti in company with HMS Lion (64) and the small two-decker HMS Janus (44). The force was under the overall command of HMS Lion's commander, Captain the Honourable William Cornwallis. On that day, they sighted and went to investigate strange sails off to the east, which turned out to be a French convoy, protected by the French ships Annibal (74), Diademe (74), Reflechi (64) and Amphion (50). On sighting the British, the French cargo ships made all sail to escape while the warships sailed to intercept the British force. The French force, commanded by Toussaint-Guillaume Picquet de la Motte, flying his command flag in the Annibal, opened fire at 17:00. The two forces didn't attempt to close the range, relying instead on long-range cannon-fire which went on until about midnight and was resumed the following morning. HMS Janus came off worst in the First Action off Monti Christi, losing her mizzen topmast and fore topgallant mast. By mid-day, the wind had almost completely died away, leaving HMS Janus in a precarious position, damaged and with to two other French ships of the line coming into range. Captain Cornwallis ordered HMS Lion and HMS Bristol to launch their boats in order to tow the damaged ship out of harms way. More stange sails were sighted in the afternoon. These turned out to be the 64 gun third rate ship of the line HMS Ruby, the 12pdr armed 32 gun frigate HMS Niger and the 9pdr armed 28 gun frigate HMS Pomona. The French force had achieved it's objective of delaying the British sufficently to allow the merchant ships in the convoy to make good their escape, so in the evening of the 21st March, the French force left the area. Tragically, during the action, HMS Janus's commander, Captain Bonovier Glover died of natural causes. On 18th May 1780, Nelson, by now a Captain, replaced the late Captain Glover in command of HMS Janus. Exactly three months after the First Action off Monti Christi, on 20th June 1780, HMS Bristol was once more off the northern coast of Haiti. Once more, HMS Bristol was in company with a number of ships commanded by Captain Cornwallis. The British force, in addition to HMS Bristol, comprised HMS Lion (64), HMS Sultan (74), HMS Hector (74), HMS Ruby (64), HMS Salisbury (50) and HMS Niger (32). Once more, they encountered a superior French force, this time comprising six ships of the line and three frigates, escorting troopships taking French soldiers to join the war in America. The French force was too strong for the British, but remained focussed on ensuring the troopships got to their destination. Other than fending off the initial British attack, the French had no intention of bringing the British to battle and simply sailed off. On 6th October 1780, HMS Bristol was dismasted in a hurricane and shortly afterwards was ordered to return to the UK for a refit. In July 1781, HMS Bristol arrived at Plymouth and paid off the following September. During her refit, HMS Bristol's armament was augmented by carronades, which were being introduced to general service at about this time. In addition to her armament listed above, she was fitted with 2 24pdr carronades on her quarterdeck, 2 12pdr carronades on her forecastle and 6 12pdr carronades on her poop deck. Between March and June 1782, her bottom was coppered. This work was completed in July at a cost of £13,567, 3s, 11d. The ship recommissioned under Captain James Burney. In September 1782, HMS Bristol left Spithead as part of a fleet of 34 ships of the line under the command of Vice-Admiral the Lord Howe, tasked with the relief of Gibraltar. Gibraltar had been under seige by the Spanish since they joined in the American War of Independence in 1778. Luckily for Howe's force, a gale blew up and scattered the Frenco-Spanish fleet blockading Gibraltar and they were able to enter the port unopposed. Under orders for the East Indies to join a squadron under Admiral Sir Edward Hughes, HMS Bristol parted company with Howe's fleet on 27th September 1782. HUghes had been fighting a series of running battles against a French squadron commanded by the Baillie de Suffren and needed reinforcements. 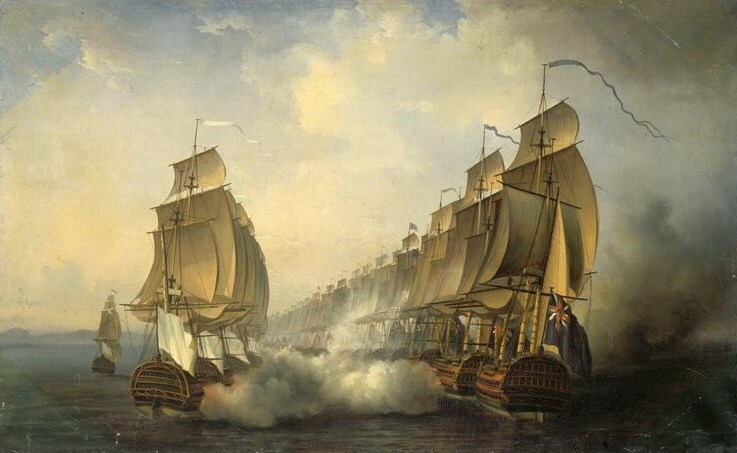 By this time, Rodney's victory at the Battle of the Saintes in April 1782 had ended French ambitions in the Caribbean, although the war on the American mainland had been lost.The Royal Navy was able to spare ships to assist in the defence of British possessions in India. Hughes' force was reinforced by the arrival of five more ships-of-the-line, including HMS Bristol, bringing his total strength to 18 ships-of-the-line plus frigates. By June 1783, the British were laying seige to Cuddalore and Suffren was ordered to support the city with his 15 ships-of-the-line. Hughes' fleet was there when Suffren arrived on 13th June 1783. Hughes was not keen on facing the French again, so moved his force away. After five days of adverse winds, Suffren anchored his force off the city. After a conference with the commander of the defending force, it became apparent that the outcome of the seige was going to be dependant on a naval action. The two fleets then began manoeuvring for advantage from 18th June, but were both frustrated in their attempts by fickle winds. Finally, the winds settled down from a westerly direction and the two fleets engaged each other again on 20th June. The action was fought with long-range gunnery and neither fleet was able to significantly damage the other and both forces withdrew at nightfall. The Battle of Cuddalore by Auguste Jugelet, painted in 1836. HMS Bristol remained in the Indies until July 1786, when she was ordered to return to the UK. She arrived at Chatham and was paid off. In 1787, HMS Bristol is recorded as serving as a Church Ship moored in the Medway. In February 1793, war broke out with France again. HMS Bristol was destined to play no part in this war. Between November and December 1794, HMS Bristol was refitted at Chatham and was converted to a Hospital Ship. In that role, she was moored in Gillingham Reach on the River Medway, off what is now The Strand. HMS Bristol remained in that role until 1810, when she was taken into the Royal Dockyard at Chatham and broken up.